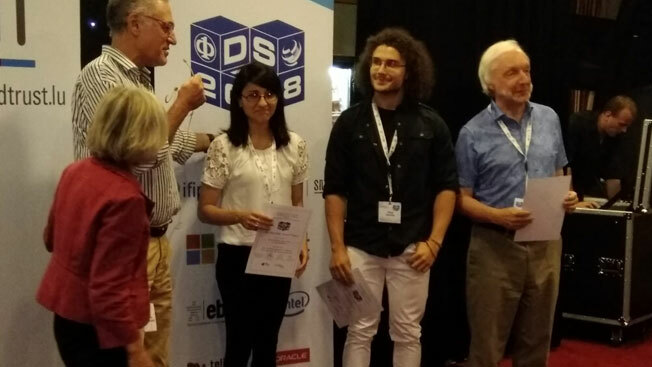 It is a matter of great pride for EPFL that the organizers awarded the Best Paper Award to Kristina Spirovska, Diego Didona, and Willy Zwaenepoel for their seminal contribution, “Wren: Nonblocking Reads in a Partitioned Transactional Causally Consistent Data Store.” All of them are attached to the Operating Systems Laboratory (LABOS). They worked together earlier on “Optimistic Causal Consistency for Geo-Replicated Key-Value Stores,” a research paper presented at the International Conference on Distributed Computing Systems held in Atlanta last year. Their research paper at DSN-2018 presented Wren, the first Transactional Causal Consistency (TCC) system that simultaneously implements nonblocking read operations with low latency, and allows an application to scale out within a replication site by sharding. The system introduces new protocols for transaction execution, dependency tracking, and stabilization. The Best Paper Award is a highly acclaimed honor conferred by the organizers on the most outstanding scientific paper among all papers included in the Main Track. The selection process involves three phases: shortlisting of papers by the Program Committee, the announcement of three finalists by the DSN Steering Committee prior to the conference, and voting by DSN attendees in a special plenary paper session.